My search history is a scary place. If one were to delve deep enough, I'm sure all kinds of strange, weird, and downright nasty things would surface. In the past, I've searched medieval weaponry, gunshot wounds (both entry and exit) body decomposition, and other questionable subjects. Lately, a large part of my research history is about poison and poisonous plants. Not just the plants themselves but how one might use them to kill another. 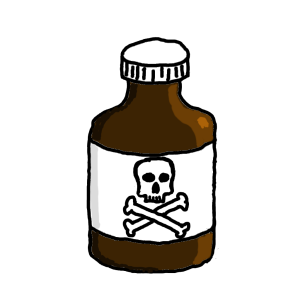 What is the most effective poison, the easiest to procure, what dosages are needed to ensure death (quick or not) and which plants do or do not show up in a toxin screen. If the conspiracy theory is true that the government keeps a record of all our communications, interactions, phone calls, and web searches, I could easily become a suspect. I just hope that no one living anywhere near me dies of poisoning anytime soon. For a current work in progress, I started with the premise of poisoning. I didn't want to portray the standard poisoning as we've all seen or read in mystery stories since the dawn of time. I wanted this poisoning to be fresh and modern. Oddly enough, my antagonist started forming as my research progressed. For writers like me, research is a must if you want your story to be believable. Of course, the first thing I did was head over to Amazon and look for books about poisons. I purchased a Writer's Digest Book from the Whodunit series called, oddly enough, "The Book of Poisons." I did not provide a link as it is no longer available in digital form and, in my opinion, is not in-depth enough to warrant the twenty to thirty dollar purchase price for the paperback. Don't get me wrong here. Writer's digest books is a great place for wannabee authors to start but, in general, just do not provide the depth of knowledge needed by anyone serious about story research. A good believable story, especially in the technical, thriller, and mystery genre can only be devised through research. I don't mean "buying a book on amazon" type of research. I'm talking about the kind of research that lands you onto the FBI watch list. So, after much research, my antagonist will kill her victim using a concentrated oil of spotted water hemlock. This is one of the most abundant and most poisonous plants in North America. Who'da thunk. Plus, it can be readily found within the setting of my work in progress. This may seem to go against the normal conventions of developing story and I just know I'm going to get some nasty comments about how I should've started with a character. But I had already formulated a basic plot sketch around the protagonist character. The antagonist character materialized around the chosen murder weapon. Will all this technical stuff find its way into the finished manuscript? Not likely, but without this background information, I feel the antagonist would be flat, two-dimensional, not at all noteworthy. So, I guess the point of this post is two-fold. First, to tell the world how excited I am to be writing a story I hope will be intriguing and entertaining. Second, to say to all the other writers out there that research can go a long way in making your characters, and stories seem more real and believable.